The Sunborn is an eclectic new concept of luxury international hotels. It is a purpose built yacht hotel and was commissioned for the Victoria Docks region of the East London regeneration area. Its dramatic features add a new dimension to the docks and is fast becoming an important London landmark. The concept of the yacht hotel is simple, to offer luxury hotel accommodation in engaging settings. 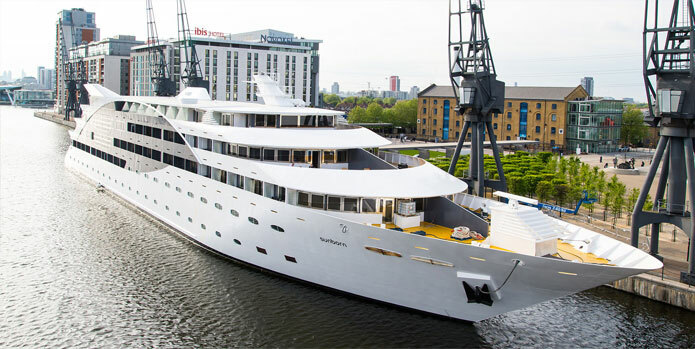 It offers both business and leisure customers the chance to experience the look and feel of a luxury yacht while being connected with London’s business and transport links. Furthermore there is little environmental impact with a yacht hotel as there is no need to physically construct a building as with other properties. The Sunborn was brought into London from its berth in Holland and refitted on the Thames before nestling into its home at Victoria docks. The soft launch of the hotel received great press coverage and it certainly brings something new to the dockland area. One thing that was missing though was a grand entrance to the yacht which would fit in with the luxury standards of the hotel but with little need for construction. We were an exhibitor at the Grand Designs show at the ExCeL arena nearby and the hotel proprietors searched there to find quality flooring that would meet with their strict requirements for the walkway. Of all the flooring exhibitors at Grand Designs we were chosen for the quality of our product and our ability to provide building stock within a short time frame. Timco Wood composite decking is modern, long lasting and easy to fit, it requires little maintenance and has minimal impact in terms of the construction process. Our solid teak boards were chosen for their light and fresh colour which fits in with the general look of the yacht. The anti-slip grooves are not only more convenient to walk on but are also better to look at with the textured grooves being pleasant to the eye, offering an engaging entrance to such a luxury premises. Additionally our composite deck boards are made with FSC® certified timber and fully recyclable HDPE plastic so are environmentally friendly as well. We were able to get the decking and fittings down to site within 48 hours following the order with the installation taking just one day to complete which meant there was little disruption to the working of the hotel. The whole process from meeting to order to installation was very fast with the proprietor commenting positively on not only the finished decking but the speed and professionalism with which we can work and fulfil orders. We are very proud to be associated with what will certainly become a landmark site for the docklands area and look forward to our composite decking being used for future prestige projects. • Our proximity to London and the national motorway network means we are well placed to fulfil orders across the UK on demand.